Riding in the Zone- For people who aren’t big readers. The highly graphic format has lots of photos, diagrams and a DVD video to help explain complex concepts. 143 full color pages. Motorcycling the Right Way– For people who like a deeper discussion of strategies and techniques used by the best motorcyclists. 239 full color pages. Riding in the Zone is a 143 page full color book includes a 30 minute DVD with parking lot drills to advance your riding ability. RITZ is for the rider who wants to get down to business of becoming a better rider. Both mental and physical skills are covered, but the focus is a bit more on the physical control skills. RITZ will help beginner, intermediate, and early-advanced riders to develop the physical and mental skills that are necessary to ride with more confidence and enjoyment. Get an autographed copy of “Riding in the Zone” and help support the blog when you buy from here. The PRINT version of Riding in the Zone is currently sold out. However, a PDF version is available. Motorcycling the Right Way offers 239 color pages describing the strategies, techniques and attitudes that are shared by the best motorcycle riders. Many chapters are culled from Ken’s 14 years as the safety/skills columnist for Motorcycle Consumer News. 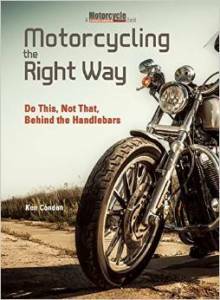 Get an autographed copy of “Motorcycling the Right Way” and help support the blog when you buy from here. Buy “The Right Way”- Note: We can only ship to the United States and Canada. Please order through Amazon for international shipping.